This paper deals how to prevent the duplication or fraudulent of works in this society. This type of works may happen either in government organizations or in private organizations. This paper considers fraudulent of works happened in the government organizations. To prevent this type of works in the government organization, let’s introduce mobile muster technology using Global Positioning System (GPS). Now consider a contract work which was given by the government organizations to the contractor. The main aim of this technology is to provide some special software based mobile to the contractor or who involved in supervising the work. The duty of his /her is to show the work progress, labourer attendance, distributing daily wages to the daily laborers regularly. In order to avoid fraud in the work, first the concerned man who involved in this work should login into the application form from the field where the work is going on. Later capture the photographs of the finished work and the remaining work to do and also the labourer involved on that day. This total information is automatically sent to the web server by the mobile. The person location who sends all this data can identify by using the mobile IMEI number using GPS and that information is stored in the database. Every user can verify this information as up to the date by using web application. By this process we can avoid fraud in the work to some extent. Before the introduction of the mobile muster technology there was a manual record maintained by the government officials (muster form fig1). This record consists of worker id, particulars of the work, date, wages, grants issued by the government. There may be a chance to misappropriate the funds by the contractor or who involved in supervising the work. For Example: In order to develop the roads in the city. Road constructing contract is taken by a contractor from the government officials. This work mainly depends on the daily wages. Here the contractor is getting funds from the government for the development of the roads. To gain some profit the contractor is misusing the funds and also using less quality material in the work. The duty of the contractor is to show how many workers are involved in the work daily and how much work is finished daily. In this muster report he is reporting more number of workers rather than the workers involved in the work daily and also showing duplicate work progress. Because of this he is misappropriating the funds which are issued by the government. 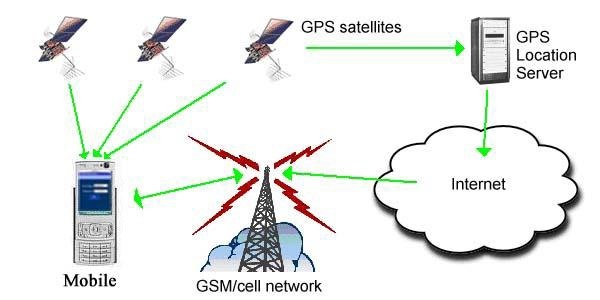 In order to avoid this problem mobile muster technology is going to develop using GPS. Mobile communications is now an established force for social and economic development. Mobile Muster technology provides an important front-line security measure for both government agencies and commercial users. Based around a Global Positioning System (GPS), mobile muster technology devices extend the functionality and capabilities of a static GPS by allowing users to observe the work progress, members attended, work delay and wages issued. The objective of this intervention is to ensure transparency in government organizations by addressing issues such as fake measurements and work duplication. Field Assistant will capture photographs of the laborers every day at work site. System automatically captures the GPS coordinates using satellite based system. This is nothing but photographic attendance of wage seekers. Theory behind this technology is that there are some divisions under government organization in the city. In the each division a supervisor is appointed with a group of ten members labour. This supervisor will supervise their group in the field work by giving daily wages. There may be a chance to misuse the funds by him. To avoid the fraud in distributing the funds we use the concept of M-muster technology. The following procedure describes how this technology is to use. Initially the organization will provide a mobile which was built with a special software to him. 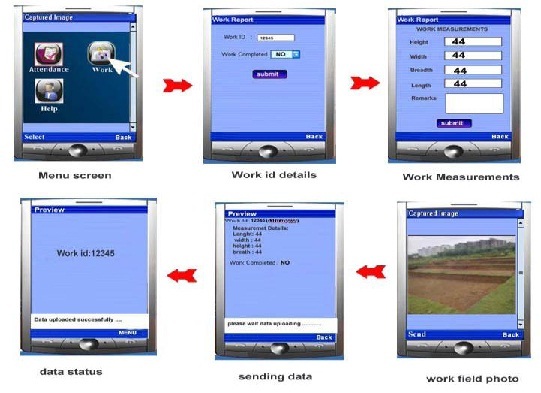 The main work of the supervisor is to login in his mobile, after the completion of login he must capture the photograph of the workers, and also capture the photograph of the field where the work is finished on that day. He must send the photographs up to the date to the server. So that every user can verify the status of the work. The system proposed in this paper works in two phases one is at server side (web application) another one is client side (mobile application). We need a mobile phone which has a GPS Receiver enabled mobile phone for receiving GPS data from the satellite. Now days a wide range of such mobile are easily available in the market and mobile must have GPRS Enabled Feature. The mobile application is developed on java platform using J2ME. 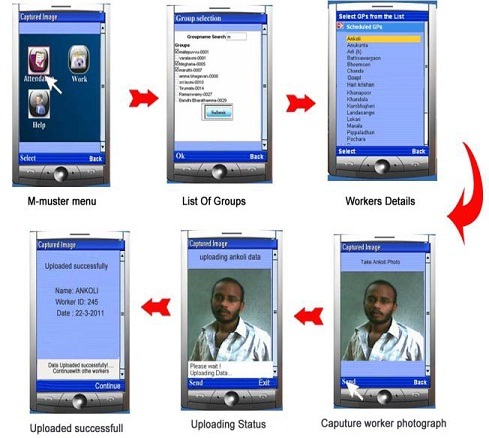 This developed software is installed on the mobile; client can send the data by using this application to the server. Whenever the user opens the m-muster application in mobile. It asks for username and password it is shown in Fig 3 .it is for security only, registered users can use this software. Registration for user is done at web application phase that is observed at next level. User needs to give the username and password then the application connects to the server with GPRS. This connection is to check for its validity whether it’s authenticated or not. At the time of connecting to GPRS it sends the data of username, password and International Mobile Equipment Identity (IMEI) number also. 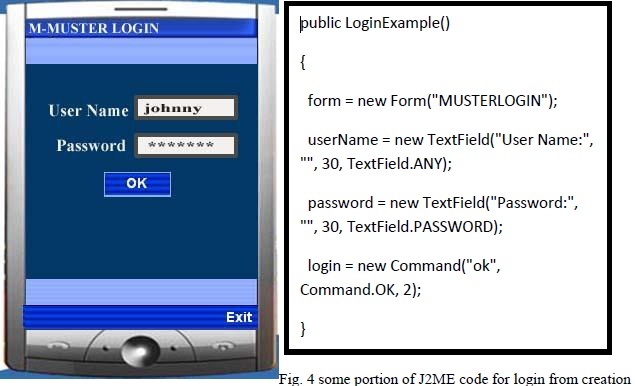 Based on the IMEI number on the server side the database checks validity of the user fig 6 shows J2ME code to communicate with J2EE web Server. 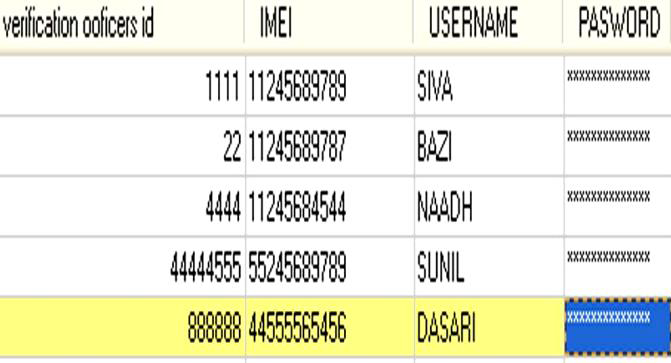 Fig 5 shows the j2me code for knowing the IMEI number of Mobile. If the user is not an authenticated then the user is prompted with a message of invalid user name or password. 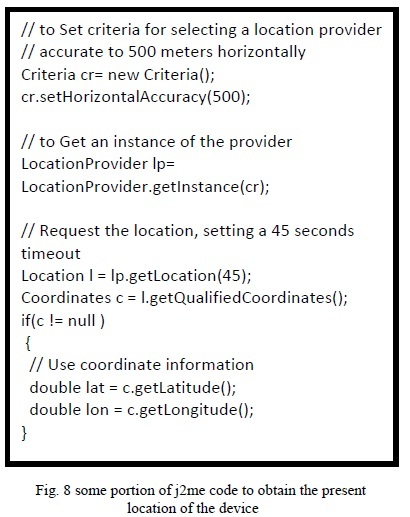 Once the mobile Application logins Successfully it automatically starts retrieving the GPS coordinates of the location Fig 7 and sends those data to the server through GPRS connection to the server with details of coordinates of GPS position then server updates these details in the database of this user is based on IMEI. Because based on the IMEI number only we can know the details of this user. To retrieve the details of GPS location we use j2me package javax.microedition.location . J2ME location API provides mobile application which gives the information about the devices present physically in the location. we used Location, Coordinates classes from the location package to get the coordinates i.e. latitude and longitude in degrees, and altitude in meters of the present location Fig 8 shows the j2me code for capturing the details of GPS Location. Next responsibility of supervisor is to send the details of the work status, for this he selects work option from the menu then he navigates to the another page that contains the status of work to do and completed work. Then he navigates to another page it contains the measurements of the work next he navigates to the page which is to take the photograph of the field of the work done. Then he enables option send, it sends the work details and photograph of completed work , IMEI Number and GPS location details to the server . Then at the server side it updates these details . The next option is help option. This option guides the user how to proceed if he doesn’t know how to operate. Based on the web application, registered data works only on m-muster software. In this the Supervisors details are registered along with his mobile IMEI (International mobile equipment id) Number and also it registers the details of workers. The whole data is stored in Mysql data base. 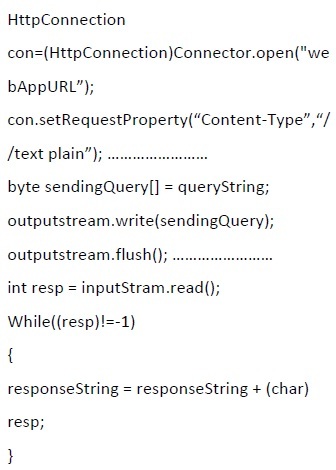 Web application is developed by using java server pages Fig 11 shows the Sample SQL database. So By Using Google Maps We Can Know the Location .When ever open this reports page it displays the location of the selected supervisor, then everyone can know from where he is sending the data. The main goal of this paper is to avoid fraudulent of works happened in some organizations by using m-muster application. It hopes that the use of this application reduces the fraud in the work to some extent and also the expense for this application is too low because in these days most of the mobiles are built up with GPS system feature. With this feature every citizen can know the status of the funds used and reported data in any time. The future scope for this project hoped is, to introduce biometric system using the mobile. This system will increase more security and provides reliable data while taking the attendance and login in to the application. Web page :<http:// en.wikipedia.org/wiki/Global_Positioning_System>, Last Accessed: 22th June 2009. James Keogh, J2ME:the complete reference, p.85-110.